In very early Asia, participants responded to Draghi's sovereign bond buying hints, and Merkel's seeming willingness to let Greece leave EMU by send the euro to a low of $1.1865, according to Bloomberg. The thin conditions exacerbated the move, but the single currency has not been able to resurface above the $1.1980 area since. Softer than expected German state CPI figures warn of a national harmonized rate of 0.1%-0.2% from 0.5% in November. The risk that Germany slips in to deflation may indeed see the Bundesbank's opposition to new asset purchases ease. This has been one of our interpretative points. One of the difficulties in coordinating policy in the euro area was the divergence of economic performances. But now with Germany having lost some momentum, and now is on the verge of deflation, it may sing a different tune. 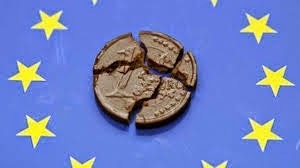 Merkel's signal that Germany could cope if Greece decides to leave EMU raises the ghost of Lehman. After Bear Stearns failed, many thought that investors had adjusted positions to cope with the higher risk environment that had revealed the vulnerability of large institutions. As we know now with the benefit of hindsight, this was not the case. First and foremost these are negotiating positions. Officials had indicated they were prepared to ease debt servicing for Greece after it had reached numerous objectives, including a primary budget surplus. This has been achieved. Both sides can play hard ball. Moreover, our understanding of the relevant treaties is that there is not mechanism to eject a country from the monetary union. The latest Greek poll (Ross) showed Syriza with a 3.1 percentage point lead over the New Democracy, down from 3.4 in mid-December. Even with the 50 seats that go to the party that gets the most votes, it is not enough to give it a majority. Moreover, 74% of those surveyed want to stay in the monetary union. A vote for Syriza is not a vote to exit EMU, even if that is what Samaras and some European officials, like EC President Juncker suggest. Greek stocks and bonds are sharply lower. The 10-year bond yield is up 18 bp at 9.17%. The Athens Stock Exchange is off 3.6%, lead against by financials and utilities (-4.9%). That said, European bonds, periphery and core, are also lower, with Italian and Spanish yields up 5 bp and Portugal up 8. Germany and France yields are up 2 bp. European bourses are mostly lower, though the German Dax is slightly positive on the day, which has helped steady the Dow Jones Stoxx 600. The UK reported a disappointing construction PMI. At 57.6, it is the lowest since July 2013. The decline since the 64.2 print in September, illustrates the loss of momentum in this sector. It follows on the heels of last week's disappointing manufacturing PMI. It fell to 52.5 from 53.3. The Bank of England's MPC meets this week, but is not expected to do anything. The market will have to wait for the minutes to see if the hawks stuck to their guns in favor of an immediate hike. On New Year's Eve, sterling recorded a high of $1.5620. Today, it hit a low near $1.5175. The low was seen in early Asia. It has not been unable to resurface above the pre-weekend low near $1.5325. The yen is the only major currency resisting the dollar's strength. It is well within the range against the dollar seen before the weekend. Weakness in equity markets and cross rate adjustments seem to be the key considerations. The economic data was mixed. The manufacturing PMI eased slightly to 52.0 from 52.1 and auto sales fell 8.8% year-over-year (from -13.5% in November). There are two other developments to note. First, oil prices remain under pressure. Brent slipped to about $55.20 from $56.42 at the end of last week. WTI is off about $1.40. Both of these benchmarks have fallen for six consecutive weeks. Second, Chinese stocks are bucking the heavy tone in the global markets. The Shanghai Composite rose 3.6%, led by the energy and telecom sectors. Money market rates eased as year end pressure subsided. The other element of the story is indications that a Hong Kong link with the Shenzhen market may be in the works. It is to be modeled on the HK-Shanghai link. Prior to the launch, there convergence between the company's shares. Since the launch, only about a quarter of Hong Kong's quota to buy Shanghai shares and less than 5% of the Shanghai's quota to buy Hong Kong shares has been used. The main feature of the North American session will be US auto sales. The risk seems to be on the upside of the consensus 16.9 mln unit pace. The low price of gasoline, the manufacturers' incentives, and the stronger labor market may help underpin sales. US stocks are set for a weak open after the heavy tone seen in the last three sessions. The gap created by the higher opening on December 18 (2016.75-2018.98) may offer a key test for the bulls.